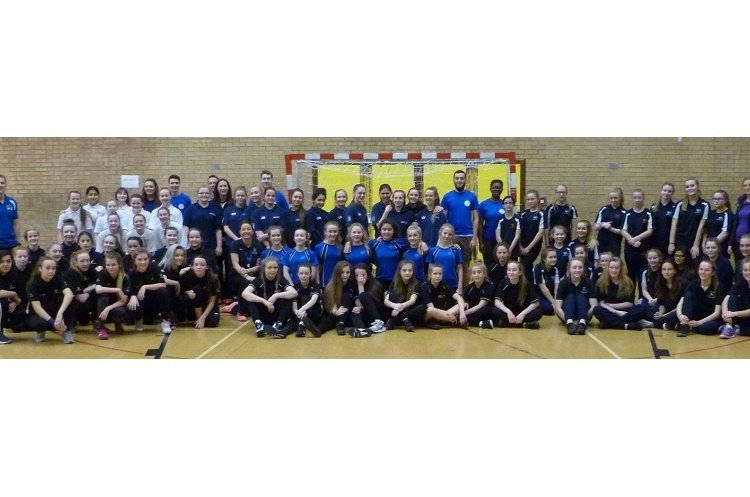 The first Tyne & Wear Handball Schools Festival on 9 December saw over 150 under-15 and under-13 girls and boys take part. The tournament was hosted by Newcastle Vikings Handball Club at their home match venue Temple Park Leisure Centre in South Shields, in association with Marlen’s Handball Coaching. It was funded through Tyne & Wear Sport’s satellite club grant award. Mortimer Community College and St. Wilfrid’s RC College made it a victorious double for South Shields schools in the morning’s girls’ competitions. Mortimer won all three of their matches to take the under-15s title. In the under-13s tournament St. Wilfrid’s won three and drew one match. In the afternoon’s boy’s competitions Newcastle’s Walbottle Campus 1 under-15s and Gateshead’s Lord Lawson of Beamish Academy under-13s were the winners. Both teams went undefeated. The winning teams were presented with an England Handball Association bag of a dozen handballs. The best players from each of the competitions each received a Newcastle Vikings Handball Club t-shirt. All the children who took part also received a Newcastle Vikings Handball Club wristband. Scouting of the best talent from the under-15 competitions also saw 20 girls and 20 boys selected to take part in next month’s Tyne & Wear county handball trials. The first round of trials will take place at Temple Park Leisure Centre on Saturday 14 January 2017 (10.00-12.00). The trials take place ahead of Newcastle Vikings ladies’ home league match against Peninsula - and the second round of the North East men’s and women’s friendly league competitions between Newcastle, Sunderland, Durham and York. Entry to watch the matches is free. Newcastle Vikings Handball Club would like to thank all the schools and children who took part in the festival.